Search ads are advertising units that appear as paid links in Google search results. Display ads, on the other hand are advertising units that appear on sites, blogs, and applications that run Google AdSense, as well as some Google sites, such as Google Finance, Gmail, Blogger and YouTube, for mobile as well. 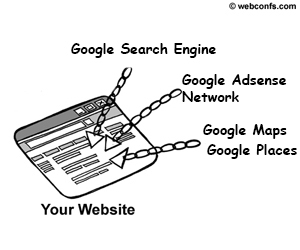 You can use the Display Network separately or in conjunction with other services, such as Search ads.